The 2018 European Le Mans Series season is over, the final delivering a year’s worth of drama in just four hours. 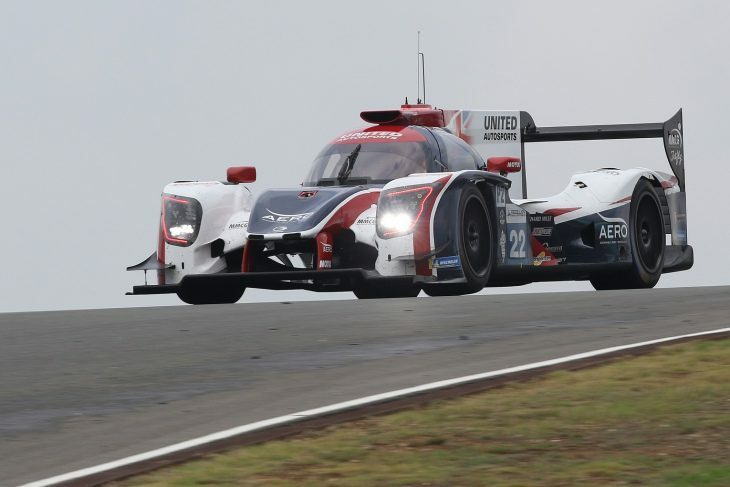 Winning the race overall was the #22 United Autosports Ligier JS P217 of hometown hero Filipe Albuquerque and Phil Hanson, the duo winning their second race in a row after a sterling performance from both. In their second race with Michelin tyres, again the speed was there when it mattered and the car finished just half a second ahead of the #23 Panis Barthez Ligier of Will Stevens, Thimothe Buret and Julien Canal. The French team will leave slightly disappointed with second, after Stevens spent the closing laps pushing so hard to get past Albuquerque and almost took the victory. “I’m so so happy, it was a crazy race, it was so close. Phil did an amazing job, I don’t know how he did four stint. I managed the tyres and traffic well but it was really hard to stay ahead as I had oversteer. It’s two in a row now!” Albuquerque said after the race. Third on the road in the race, after an astonishing comeback drive following an early collision which dropped the car to the back, was the title-winning #26 G-Drive Racing ORECA of Andrea Pizzitola, Roman Rusinov and Jean-Eric Vergne. However, the team would lose its podium after the race, as it was handed a 10-second time penalty during the final hour for gaining an advantage with track limits, dropping the car to fourth. This handed third to the second United Autosports Ligier of Will Owen, Wayne Boyd and Hugo De Sadeleer, which was involved in a thrilling four-way fight (with the car’s mentioned above) for the lead after a late-race safety car, but was unable to challenge for the lead and faded away. 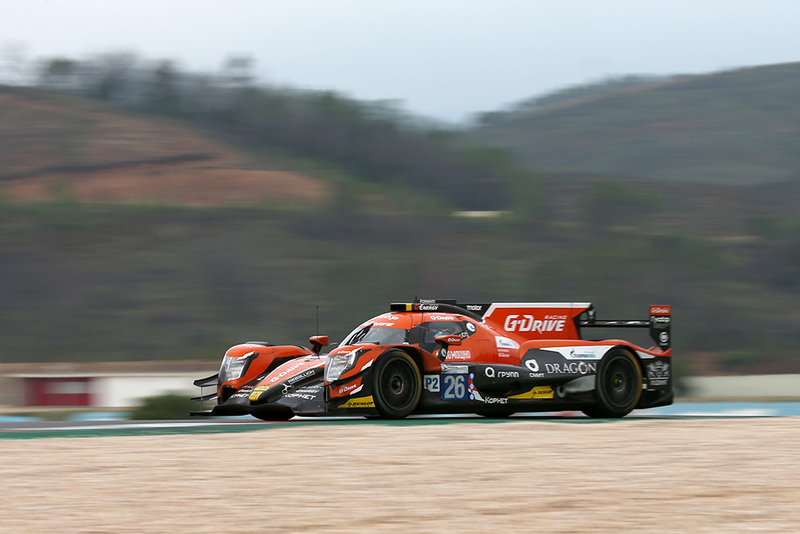 The result was a good one for Ligier, it must be noted that with G-Drive’s penalty, the podium was a Ligier JS P217 (and a Michelin) 1-2-3 on a day which saw many of the race’s contenders hit trouble, hit other cars, or suffer poor luck. It could so easily have been a banner day for Dallara, both the Cetilar Villorba Corse and AVF cars led at times, Felipe Nasr driving beautifully to take the lead but making a major error as he clipped one of the Proton Porsches in a late lunge to pass before piting, that cost him a penalty before Giorgio Sernagiotto started to suffer braking issues, the car garaged for repairs before rejoining the fray. Henrique Chaves too was in contention, the Dallara pair running 1,2 for a time, nboth looking very competitive. Konstantin Tereschenko though let the side down badly, an ill-judged move collecting the #3 United Autosports and #7 Ecurie Ecosse/ Nielsen LMP3 car and attracting the ire of Eduardo Freitas, a two-minute stop and hold penalty doled out together with a dressing down over the radio that the same driver had been guilty of not dissimilar transgressions more than once this season already! The ORECA pack suffered several issues, many of them self-inflicted – the #26 spun around by the #28 IDEC Sport 07 of Memo Rojas, and getting a penalty for his trouble, the #29 leading the race but the Duqueine car later suffering a rear suspension failure that dropped it too out of contention. 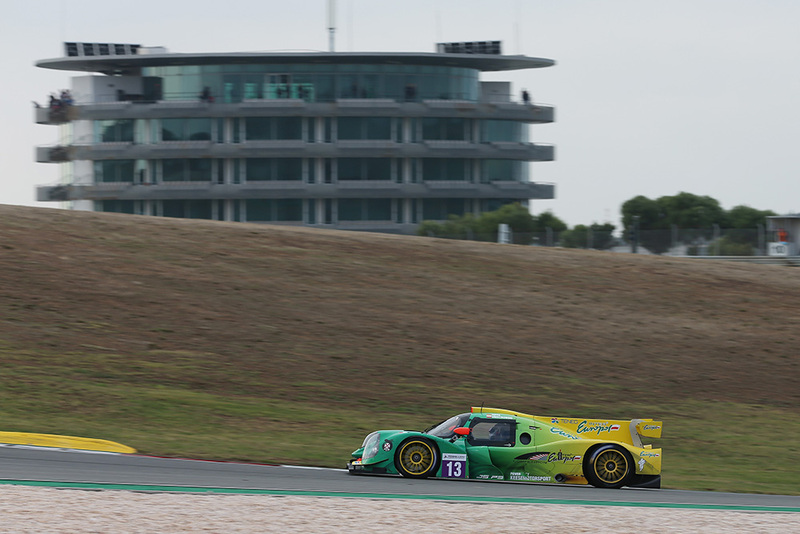 In LMP3 meanwhile, Inter Europol scored its first ever ELMS victory, Martin Hippe and Jakub Smiechowski delivering the goods for the plucky Polish team with a faultless performance that saw them quietly emerge as the race leaders towards the end. 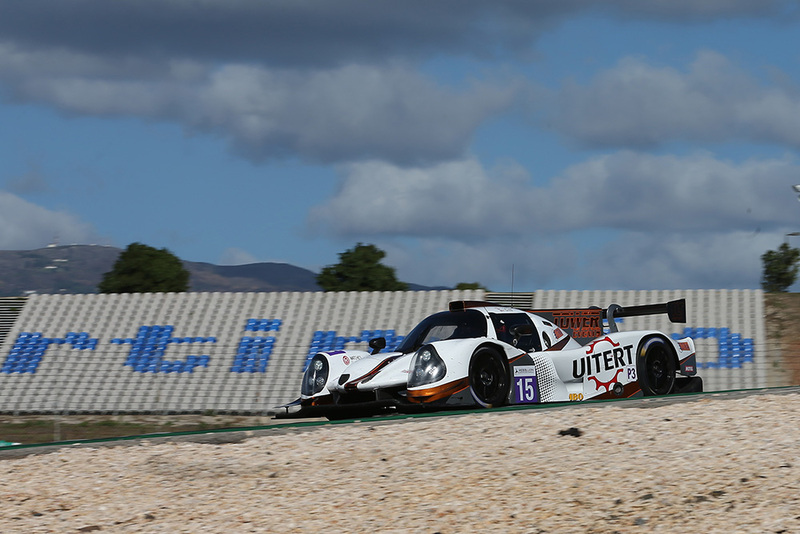 The duo, driving the #13 Ligier, were in title contention, but even with full points and their best performance of the season, it wasn’t enough to take the title. 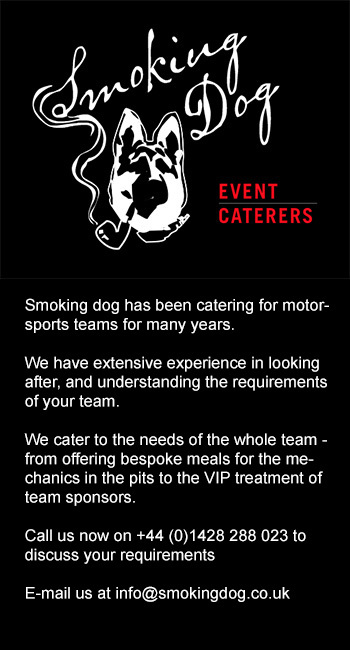 Instead, RLR Msport was able to cruise to the championship, after a topsy turvy race for the team which saw them lead the class at one point by a healthy margin after Job Van Uitert’s time behind the wheel in the first half. An ill-timed safety car cost the team dearly though, and the team’s chances of winning faded when Farano was swallowed up at the restart by the chasing pack; the Canadian quite rightly opted to keep it conservative! 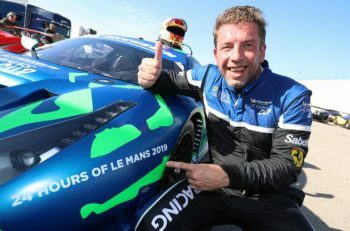 That paid off in the end, as Rob Garofall (who brought the car home), Van Uitert and Farano scored RLR its first ELMS LMP3 title, and their first as a trio, after a fifth place finish to conclude what’s been a magnificent season. RLR also scores a Le Mans invite with the title win. Completing the podium behind Euro Interpol’s lead Ligier was the #7 Ecurie Ecosse / Nielsen Racing JS P3 of Colin Noble, Alex Kapadia and Christian Olsen, which gradually moved up the order from as low as tenth in the opening laps, through Kapadia and Olsen’s stints, before Colin Noble climbed in for the final hour and took second. 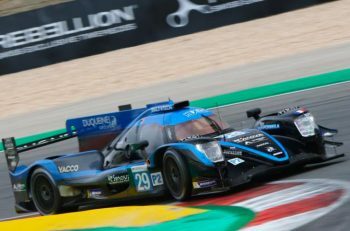 Noble emerged 14 seconds off the leading car after the team’s final stop, but couldn’t reel Hippe’s Ligier in due to the car suffering from a lack of top-end speed caused by damage to its floor after the AVF Dallara hit its left-hand side. Instead, Noble settled for second, thus, the Scottish team, which won the Le Mans Cup race earlier in the day, will have to wait until 2019 to nab a maiden ELMS class win. The #2 Spa-winning United Ligier of outgoing champion John Falb and Scott Andrews finished third, recovering well from suffering damage at the start of the race which cost the duo valuble time in the pits for a nose-change. The GTE title went the way of Proton Competition, which dominated the race with its #77 Porsche 911 RSR of Christian Ried, Marvin Dienst and Dennis Olsen, finishing a lap clear of the rest of the cars in the class with the exception of the second-placed JMW Ferrari after gaining a big advantage in a Safety Car period. But it was the sister #88 Porsche which took the title with a third place finish. The pole sitting car – the #66 JMW Motorsport Ferrari F488 GTE – started by Liam Griffin briefly led but was passed by Nic Jonsson in the #83 Krohn Racing Ferrari. The #88 Proton Competition Porche 911 RSR started by Gianluca Roda, also had a difficult start, the car suffering heavy rear-end damage early in the race, the car circulating with its entire diffuser and rear bodywork missing, forcing the team to complete repair work at a later stop. The rest of the class entries suffered so many incidents though, that the car didn’t drop out of contention, and still took a podium finish and won the title by 7.5 points. Duncan Cameron in the #55 Spirit of Race Ferrari F488 GTE was making progress up the order but he had been involved in the #88 incident and was carrying damage too. 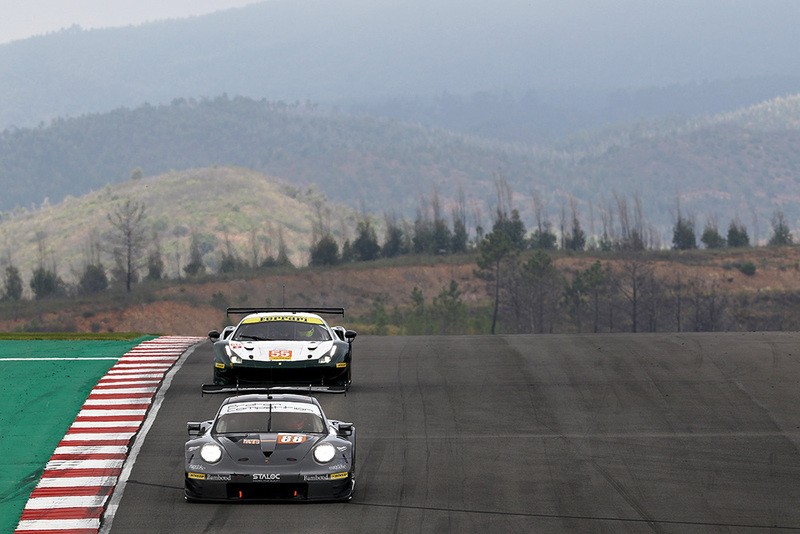 Cameron would though push on and take the lead from Jonssonahead of the #77 Proton Competition Porche 911 RSR driven by Christian Reid and debutant Gianluca Giraudi in the #80 Ebimotors Porche 911 RSR. Once all cars had pitted, the #88 emerged in the lead ahead of the #55 by then driven by Aaron Scott and Dennis Olsen in the #77. The three cars battled for the top three positions for several laps and by lap 57 the #77 led the #55 and the #88. At the top of the third hour, Olsen had built a lead of 15 seconds over the #55 and 30 seconds over the sister car which replaced its rear diffuser during its second pitstop. Moments later, the #66 was at the heart of two incidents: first, a collision with the #88 followed by a contact with the #17 Ultimate Norma M30 at T4. The #66 was given a drive-though penalty as a consequence. With 90 minutes remaining in the race and with all contenders having done their second pit stop, the 77 had extended its lead over the #80 Ebimotors Porsche driven by Giraudi, but an incident for the #80 would eliminate it from title contention, and would ultimately settle the race, and the championship! On lap 91, the #80 had contact with a prototype and stopped, drivers left, with broken rear suspension. That left the car out of the race and also saw the introduction of the Safety Car to permit safe removal of the broken 911 RSR. Behind the Safety Car the #66 was just ahead of the #88, both ahead of the race leader, but crucially so too was the #77, and as the wave by was executed, the #77 inherited almost a full lap’s advantage over the chasing pair, with the #55 losing a full lap, effectively out of race, and title, contention. The top three positions remained unchanged until the chequered flag, the #66 pulling away from the title winning #88. Just off the podium was the #55 Spirit Of Race Ferrari 488 GTE shared by Duncan Cameron, Matt Griffin and Aaron Scott. JMW then couldn’t take a second title in a row, but the team did claim the second Le Mans auto entry, along with Proton.